Failing strength, advancing years, and weakening eyesight may not dull the wanderlust in the heart of the traveler – what alternatives are available to ease the travel experience for the itchy-footed elderly? There are many – the cost often varying in direct proportion to the level of ease and convenience provided. Careful shopping and the assistance of a good travel agent can help. Having a boat as home base eliminates the bother and confusion of packing and repacking, saving energy for the important business of sight-seeing and socializing. Every night spent in the same bedroom eliminates the possibility of something critical being left behind. Having the same bedroom layout, dining room access, and elevator access each day is a great help to a visually or mobility-impaired traveler. If the goal is to relax, eliminating the tension of getting to know a new “home base” is a big plus. The ratio of personnel to guests is usually high on a cruise ship, ensuring there will be plenty of assistance available as needed, either for embarking and disembarking or for planning and enabling excursions along the cruise route. Being on a cruise ship allows the scenery to come to the traveler. 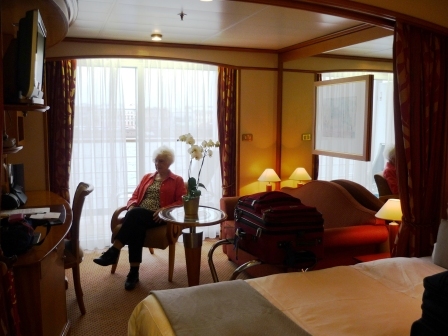 One elderly friend of mine enjoys cruise after cruise on the same ship. He has become friends with the crew, enjoys the amenities on board, observes the constantly changing scene at the ports of call and in between, but never leaves the boat. Cruises can be pricey; look for discounts at the edges of the season. We were able to book a seven-day cruise on a 6-star cruise line at a very considerable discount in the spring of 2012 during the European economic crisis and just after the Italian cruise ship Costa Concordia ran aground . If your times a bit flexible, you may luck out. A travel agent can be very helpful in sniffing out the best deals. Cruises do depend for success on smooth water, good weather, and capable crews. There are storms on the Baltic, hurricanes in the Caribbean. There is no calm-water guarantee, and no way to pull over to the shoulder of the sea until the roughness goes away. And those pictures of the Costa Concordia are not reassuring. Cruises can be cliquish. Use the Social Director or equivalent to match you with other unattached pairs if you are not part of a family or tour group .Mom and I were hoping to connect with some other couples and singles during the cruise, to lighten the dependence on each other, but it didn’t happen natuarally. When toward the end of our cruise we mentioned our wish to the Cruise Social Director, he swept us into a group of other unattached pairs and we had a wonderful evening – we should have done this right away. If you are on a cruise where there are “deluxe” dining areas, rush to sign up for these the instant you arrive on the boat – we never made it to the top-of-the-line restaurant on our boat because it was completely booked by the time we arrived just an hour past the earliest boarding time. Fortunately, the other restaurant choices were delectable – no worries. The buffet is good if you are in a hurry to eat in order to be on time for some activity; otherwise don’t waste your calories here if there is a full-service restaurant available. After our first day on the boat we never served our own lunch again. Fascinating article, Allison. Fun to read and informative. Too bad I get seasick…. Indeed an interesting article Allyson. I’m lucky that so far I haven’t gotten sea sick. The cruise line I’ve been on has a web page for booked cruises where they allow one to book ahead for their premier restaurant. The outside date is about 2 1/2 months before the cruise date. They do fill up quickly, but the fancy presentation is quite special.